Kids some time get bored of banana and refused to eat it. This recipe is a quick way to make the bananas into a tasty snack which no one can refuse. 1. Remove the skin of the banana and cut its bottom and top. Then cut the banana into 1 ½ inch pieces diagonally. 2. Heat the pan, add butter then add the sugar when butter starts to melt. Stir them well till the sugar dissolves completely. Do not caramelize it. 3. Now add the banana pieces and mix them with sugar syrup. 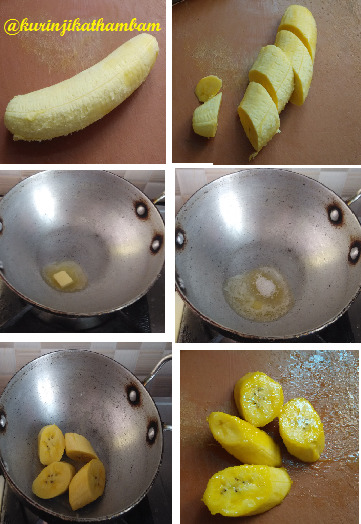 Rotate the banana pieces using the spoon so that all its sides are coated evenly. 4. Take out the sugar coated banana from the pan and allow it to cool down completely. 5. Now arrange the banana pieces on the plate and pour the chocolate sauce over the banana pieces. Now serve it with fork. Really yummy and tasty chocolate banana is ready. Click here for homemade chocolate sauce recipe. 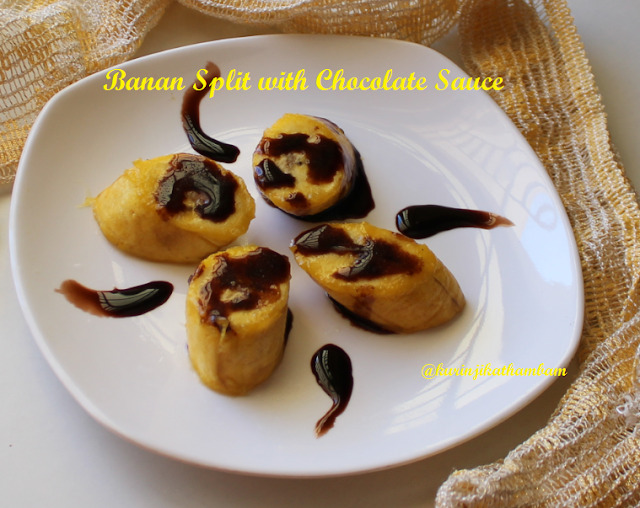 I feel Nendran banana is best for this recipe. Yummy and lovely , nice combo banana and chocolate ..!! !